Mk. IV sits further back and allows the prop shaft to sit vertically. Just a quick post to mention how the latest version of the motor mount performed during testing on Saturday last and now with the first photo of the Mk.IV above which sat in place without even using Bungees(Will not test without them though!). Below I’ve added some quickly taken photos showing the Mk.III mount in the water and out. Will post some clearer ones showing bungee positioning etc. once I’ve made a final decision on the best all round mount design. Got a bit carried away chatting to onlookers and playing to take more, as it should be! Well, fantastic results! 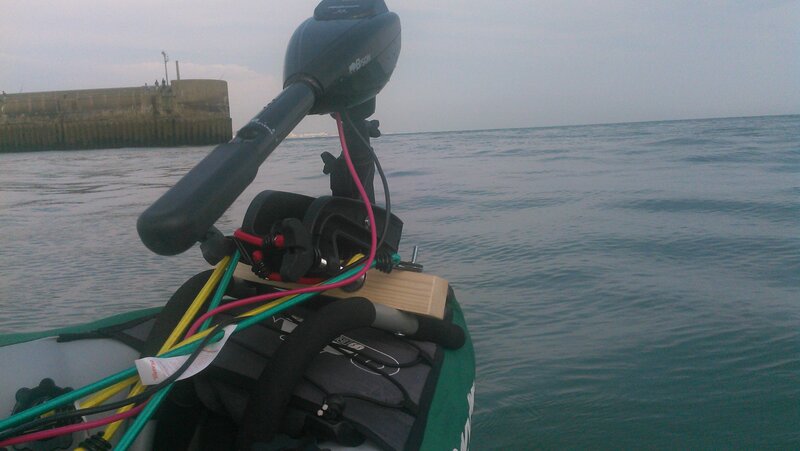 The mounting stayed secure even with the 62lb motor at full power, turning easily even out in a light swell on the sea. Stability that became an instant worry when trying full power on the side mount was not a concern at all with this version. 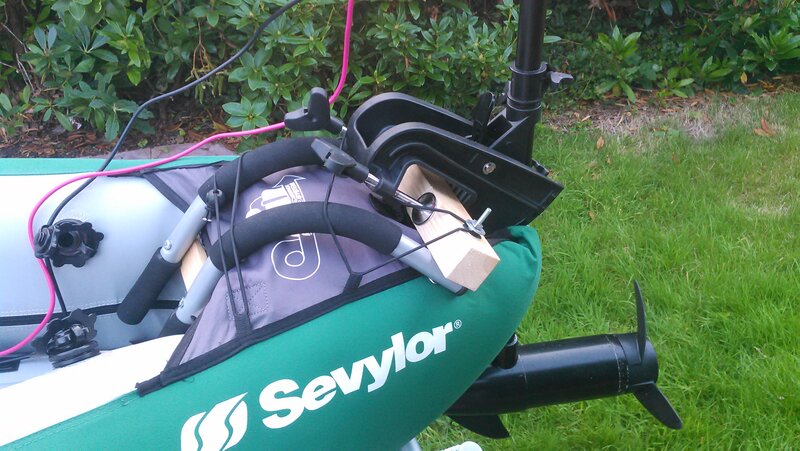 The mount design is certainly the best so far with the very useful bonus of acting as a carrying bar for the motor. Just leave the motor attached to the mount and put the mount over your shoulder (The padding on the Iron Gym bars is a bonus too)! 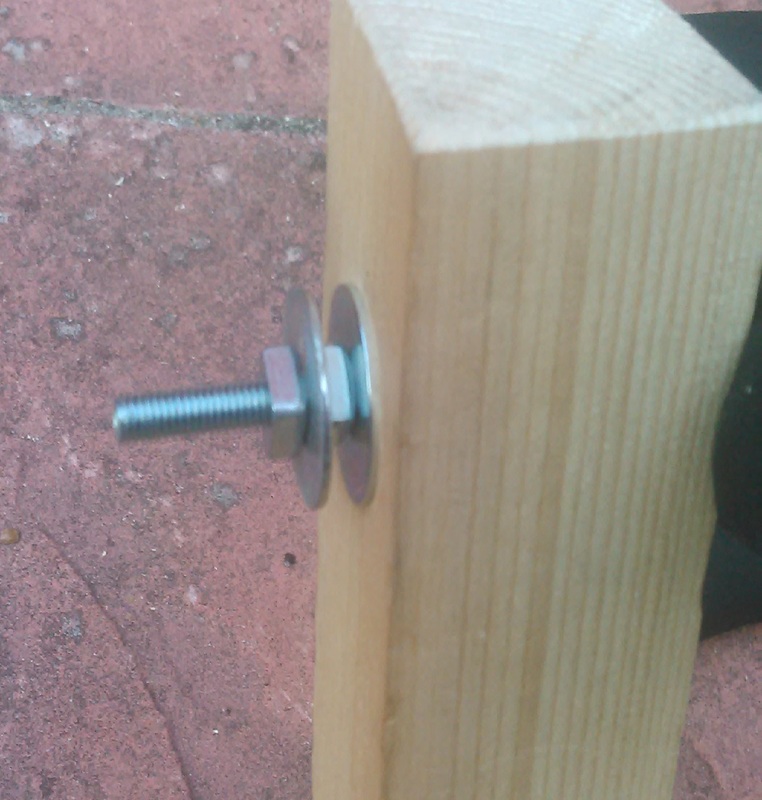 Whilst still sticking to my zero cost principle, I’ve used some off-cuts to fit for now so using a 30 x 4.5 x 4.5cm length of wood for the motor to fit to and a strip of 15 x 1 x 4.5cm drilled at a haphazard angle to fit the tilted bars and hold them together. With the ends of the bars sitting either side of the aft of the kayak and the other ends sitting just inside by the splash deck, it balances nicely. The other is to reverse the bars so that the mounting bar sits further back, although this may result in the bar that rests in by the skirt, not reaching. Testing that method tomorrow..
Am still smiling and thinking of where I can get to the water easily without crossing a beach so I can load up two 70ah batteries to run at top speed for longer. Sowing wide straps to hold the bungees onto the outer skin to save the seat straps being strained could be the next development or consideration if you’re working on your own. 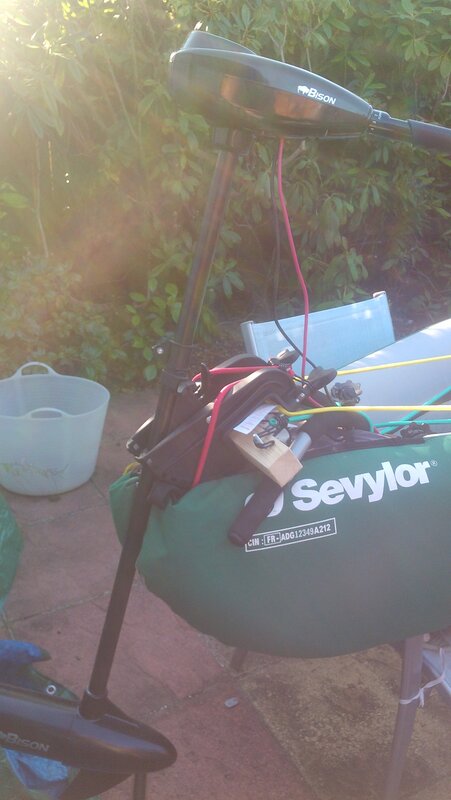 This entry was posted in Inflatable Kayak / Canoe - Motor Mount and tagged adventure plus, bison electric motor, canoe, electric outboard, inflatable, kayak, motor mount, outboard, sevylor, trolling motor. Bookmark the permalink. How do you turn and control the motor with the aft mounting? Sorry for the late reply, I’ve not been online much recently. Although the extending throttle does reach just behind one’s head, that is a question I’ve been giving much thought to. 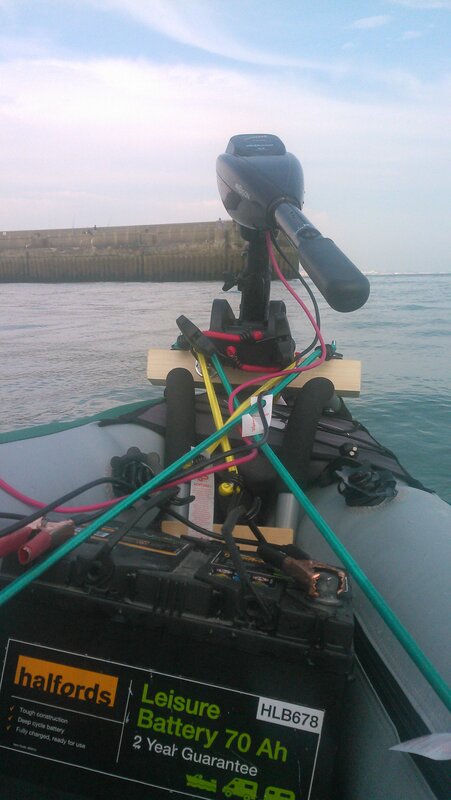 Currently I’ve been sitting side-on with my feet over one side or other of the kayak or alternatively fixing the mount quite firmly so I just have to reach back to change direction occasionally or by fixing it straight and leaning to steer (when in quiet or open water). I’ve seen a few simple ideas about making an extension using plastic tubing just a bit thinner than the throttle, cutting a few lines at one end so it will spread over the throttle and perhaps tying a thick elastic band to tighten.